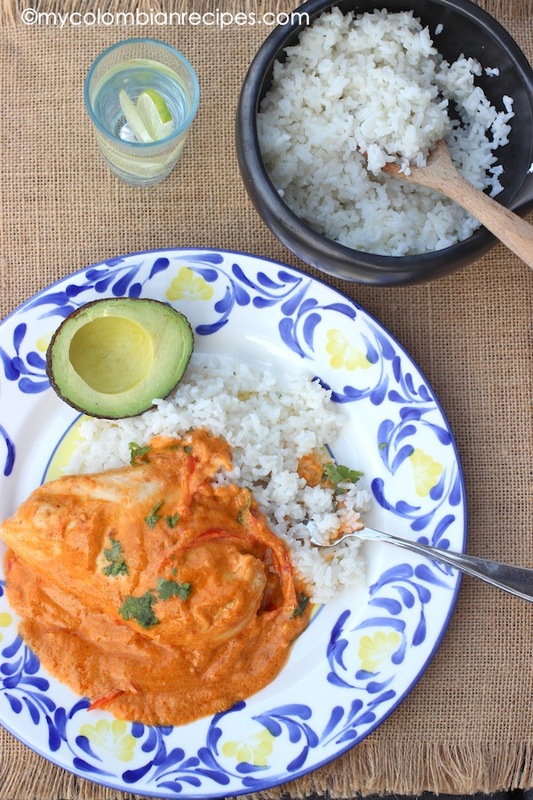 This Pollo en Salsa de Coco (Chicken with Coconut Sauce) is a popular Colombian dish and is a quick and tasty way to cook chicken. I made it with chicken drums, but you can use any part of the chicken you prefer. The sauce can be used for other poultry and fish dishes as well. Serve hot over white rice. 4 Chicken drums, bone in and skin on. Heat the oil in a medium sauce pan, over medium heat. Place the chicken and cook for 3 minutes or until golden brown, turn over and cook for an additional 3 minutes or until the second side is browned. Remove from the saucepan and set aside. Add the onions, garlic and red pepper to the sauce pan. Cook, stirring occasionally for 6 minutes. Add the tomato paste and cumin and cook stirring constantly for 2 minutes. Return the chicken to the saucepan and stir in the coconut milk and chicken bouillon. Bring to a boil, then reduce the heat to medium low, cover and let it simmer for about 20 minutes or until the chicken is tender. Taste and add salt and pepper. Stir in the chopped cilantro and serve warm over white rice. MMMMMMMMMMMMMMMMMM…..fab! What else can I say? 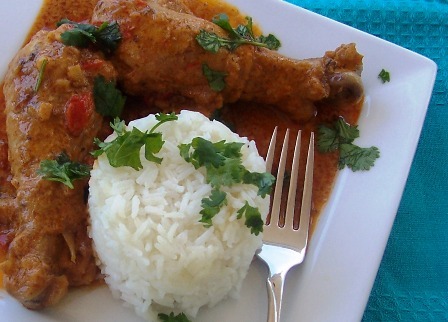 Delicious chicken with coconut milk! I love how this combines tomato paste and coconut milk! 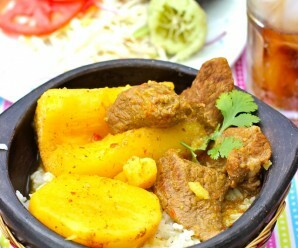 Your lovely photo shows exactly how I would eat this – with rice, to soak up all that wonderful tasty sauce. I am coming over 😉 this is not helping me at all at lunch time with nothing to eat but the mickey mouse chicken nuggets. 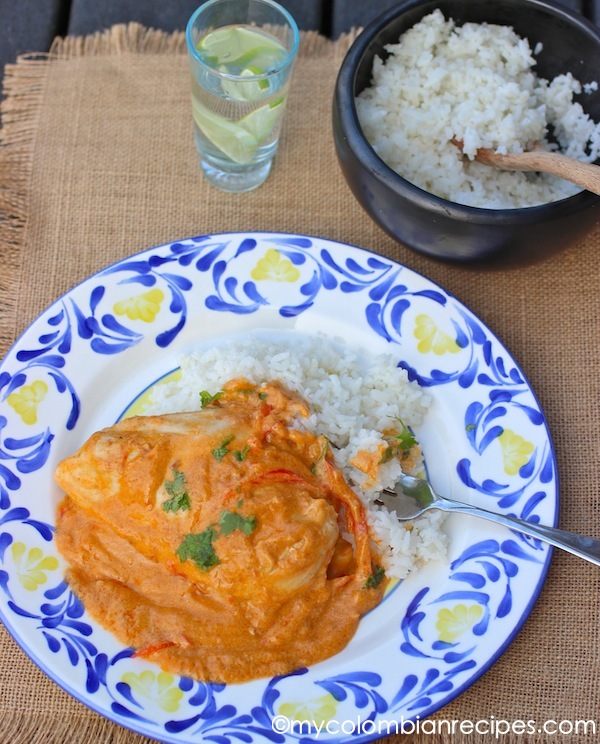 Chicken with coconut milk sounds divinely rich! wow i love columbian food wish you had a restaurant! Love, Love, LOVE your site! This is exactly what I love about cooking. Learning traditional meals first hand from other cultures. 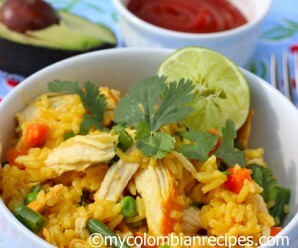 Being Latina, I am so excited to start on your Columbian recipes! 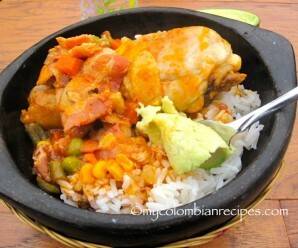 i am from barranquilla, colombia….and love the food from my country even thou i was raised in the us….my mom always cooked colombian food at home…but i never remember eating this chicken with coconut milk…mmmmm sounds delicioso!!!!!! Thank you so much for that comment. I really like your blog too. Oh wow– does this sound delicious!!! 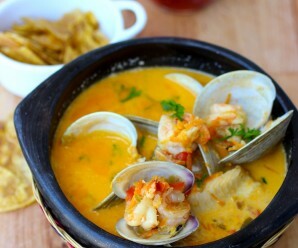 i will make this dish tonight! thanks! I made this dish yesterday for a wedding shower today. The groom is from the US and the bride is straight from Colombia. They both loved the chicken! The only thing I did differently was use boneless chicken breasts. I made enough for about 30 servings and there was only 3 small pieces left! I am sure they will be eaten later tonight. I will definitely make this again! Wow! Just wow. I made this for my wife (de B’quilla) and she almost cried. I bought a great cookbook in Cartagena but you just can’t get the ingredients (or the form they are in) here in MN. Your recipes make everything so much friendlier! Thank you so much Brian. Glad you like the recipe! I have made two coconut dishes from this site and they both worked out great. I will definitely try others. Can’t wait for my husband to come home to this yummy surprise! Cristina- Thank you so much for your feedback! I made this last weekend. ¡Sabroso! A toda la familia le gustó. I have been enjoying the left-over sauce over rice and anything else I can put it on. Muchisimas gracias por compartiéndola con nosotros! Un abrazo. I made this dish for a dinner party and It was a hit. Everyone loved it. I used boneless chicken. This dish is delicious. I made it last week and we loved it. I ate it the next day and it was wonderful. Great recipe. Thanks. I really love Colombia food. I make this all the time. It’s so easy and so tasty. I mix all my left over veggie in it too, which is a good way to clean my fridge. We will be making it again for sure! Made this for my Mother in laws bday. So happy it was perfect! She is columbian as is my father in law. I love this site. Thank you very much for sharing. I made this recipe this morning with boneless chicken breasts. I brought it in to work for lunch today. I can’t wait to taste it. It looked delicious!! Erica, thank you from a fellow Colombian who misses the tastes and aromas of our beautiful country! Look forward to making more of your meals. This is sssoooooo yummy, just finished making it! Imma look like a rockstar tonite! Thanks! Im vegetarian so I didnt get to try it…. but, i did try the sauce mixed with the rice and oh boy oh boy! I just loooooooove your recipes! I am going to try this this week! What would happen if you were to throw some potatoes in the sauce? I added potatoes before and it is delicious. Glad you have a big bowl of rice to sop up that great sauce! I cooked this dish…wowww…my husband loved it….I made it with chicken breast and I cut into small and thin pieces plus a pinch of red pepper…delicious !!!!!!!!! Thank you Erica! added fresh zucchini from our garden and it was soooooo gooood. drink it all by itself. I tried this today and I don’t know where it went wrong. I followed the recipe exactly. I’m not sure if it was the brand of coconut milk i used? When i opened the one i used, it had small solid clumps (i do not know if thats normal.) Do you mind telling me what brand you use? It would be greatly appreciated! I use different brands….Goya or Thai kitchen. Unsweetened or sweetned coconut milk???? I made this on Sunday. It was amazing!! Everyone loved it!! Although my sauce wasn’t as dark as yours. Any ideas? Hi, I want to try this tonight. Can I use chicken thighs instead? Would it be the same cooking time? Thank you!!! Thank you for your recipes. My stepmom is from Columbia and I love her cooking. I make your recipes all of the time to think of her and her delicious dishes. Thank you!! 🙂 This one is my favorite! Is it sweetned or unsweetened coconut milk? Yummy! It looks so delicious! Yo no use chicken bouillon tablets por sus ingredientes. Con que lo puedo reemplazar? This is another “Go To” recipe of yours that we use regularly. Delicious! Thanks!